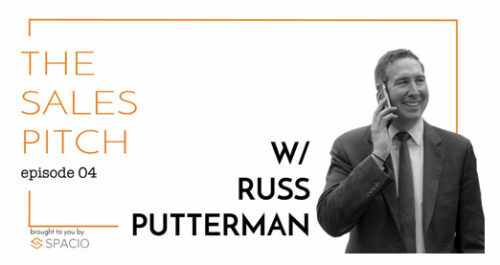 How have Russ and the team expanded their network of clients? There are a few different sources that we have noticed the highest success for expanding our network. This includes constant updates to the database, consistent open houses, hosting or attending networking events and being open to connecting with people that we may not know. How does our team perpetually differentiate ourselves within Manhattan? We do our best to run our model per the “Millionaire Real Estate Agent” by Gary Keller – The methodologies from this book allow us to have specialists such as team members on the buyer side, commercial and seller side. With this is in mind, we are able to direct leads in different directions through our systematic workflows in our internal CRM system and hold high accountability for team members to follow up with these leads. How to build rapport with someone you don’t know and what are Russ’ favorite conversation starters? An easy way to build rapport is to find commonalities and ask open ended questions that can continue to grow the conversation. Some examples of simple starter questions include – where are you moving from or how long have you been looking. How is the Focus team trained? This is a two fold answer – The team is offered training through the Keller Williams NYC market center. Team members are advised to attend training at least once a week and the market center offers trainings almost daily. We also offer team level training – everyone has a weekly consulting and reporting meeting to goal setting, finding what they are looking to achieve. The team also offers the component of hands-on training. This would include hosting open houses and taking buyers on tours – agents who have more experience are also available to provide leadership and guidance along the way. What is Focus’ system for following up? This all truthfully depends on type of contact. As mentioned previously, we segment contacts by specialist but we also segment those who have been “met” vs. “not met”. For those who have been met, we set a goal of reaching out 30 – 40 times per year through the phone, email, mailers and events. For those who have not been met, we often start with more frequent touches and then decide after a certain amount of weeks how to categorize. How can agents up their sales game? The key is LEAD GEN – make sure you track in your CRM or spreadsheet for every communication that you have with people – the follow up is just as important if not more important that getting the initial lead. To listen to the full podcast which includes more information on average conversion rates and channels used to nurture leads, click here. If you are interested in learning more about our team, contact us today or text us (347.974.4079). There Should Be Differences in the Way to Treat Database – James Hern from Kansas City was on the panel and gave advice for making the most of a database. The biggest takeaway being that segmentation should be hyperlocal. “Be your database’s Angie’s List in any facet of their life. If they lost their job, be their advocate.” Michael Hern also from Kansas City says to make your business a VIP experience through events and client appreciation. Rapport is Key for Your FSBO Strategy – Marc Fox from Portland mentioned “We need to put on the hat that they’re wearing.” And, his approach isn’t ‘salesy’ – his goal is to build rapport and establish his expertise. Areas of opportunity include asking questions about understanding the FSBOs goals to be able to sell effectively (ex: finding out about importance of price drop or adjusting the marketing plan). The Power of Texting – Richard Schulman offered insights to the simplicity of texting and how this simple relationship building tool could lead to major opportunities. A simple text that reads “Hey, [client’s name], do you want to grab coffee next week?” The goal is to just spend 20 minutes or so catching up a client, answering their questions, and reminding them about their expertise.This can also be beneficial for contacts that you have lost touch with overtime. Emerging Technologies are Coming Through Command Labs – On day two of the event, KW Labs took the stage to explain some of the groundbreaking technologies coming to the industry to continuously improve the consumer experience. Focus Real Estate is a team at Keller Williams Realty International who leverages the network of over 180,000 agents, in over 800 offices, in 34 countries worldwide. For more information about our team, contact a member of our team today. 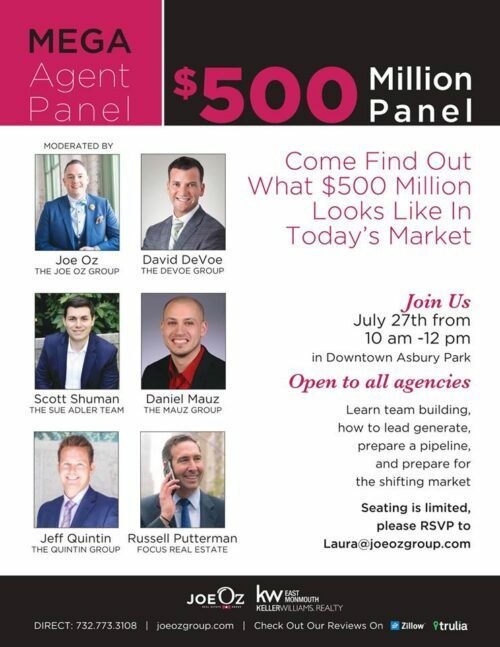 On July 27th, our very own Russ Putterman was part of the 500 Million Dollar Panel in Asbury Park. This Mega Camp event was open to all agencies and discussed tips for team building, lead generation tactics, preparing a pipeline and preparing for the shifting market. One crucial item that was brought up was to also evaluate performance every couple of months to see what lead gen sources are performing best and what could be removed from strategy. 2. Team Engagement – The panel offered some ideas for how to get teams engaged and also hold everyone accountable for their roles. At Focus, we have a weekly meeting to go through the “411” – This is a report that reviews the staff’s big yearly goal that is wider scale, followed by a monthly goal that will help to achieve the year long goal and then smaller goals for the week that will help to reach the month goal. Other approaches on the panel consisted of coaching to assist with goal setting, timely structure for prospecting, accountability meetings to track patterns throughout the week and role play practice. 3. Importance of Your Database – When asked the question – “How important is your database to your business”, the answer was unanimous – very important. Real estate is a relationship building business and teams must be utilizing it to maximize opportunities with leads. In this digital age, it is especially important to segment leads and offer different opportunities. For example, if there is a VIP client list, the contacts here may require a heavier amount of communication MOM. 4. How to re-engage a database that hasn’t been touched in a while – Every once in a while, life can escape us and constant contact engagement can be put on the back-burner. If this is the case, it is recommended to call your past clients, apologize that you haven’t been in touch in a while, let them know that you are still in real estate and see if you could be of any assistance. With an unengaged database, sharing market updates, community news, interest rates, etc. can also help to get leads more engaged. The goal is to give value to get value back. 5. Market Shifts – As far as NYC real estate goes, we have been in a buyer’s market that started about 60 – 90 days ago. Trading is still occurring, but buyers have leverage. More information on each panelists’ successes and team strategies can be found in the video below. Focus Real Estate Group was founded in 2010 and centers around commercial and residential listings in NYC and Long Island. To learn more about working together, contact us today. While trying to find the perfect home, there are many other hurdles in the way such as identifying building types and getting board approval. 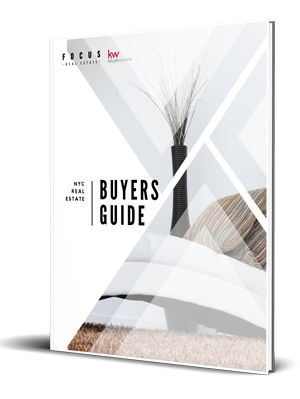 Our team has put together a comprehensive guide to help you along the way in your buying journey.